Hardcover: $26.99. At 342 pages it includes an Acknowledgement. This book is also available as an eBook and as an audio book from Penguin Random House. If you like The Big Bang Theory. If theoretical physics makes you warm. If you Google string theory. Blake Crouch, an eclectic writer, was probably best known for his Wayward Pines trilogy until his book, Good Behavior. His Wayward Pines became a popular television series, as has Good Behavior. 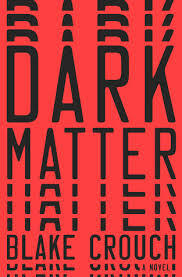 This book, Dark Matter, appears to be destined to follow a similar popular path. It will be released as a feature film in theatres in the near future. It is not difficult to see why his works succeed as well as they do, Mr. Crouch has a way with words. I can see, experience them. Example: “He kisses her out of nowhere, backing her up against the cabinets, the counter digging into her back …” I can feel the counters pressure against my body. Mr. Crouch has a decidedly different writing style. Many sentences are clipped, short sentences with no verb. Many of his paragraphs comprise only one sentence. Initially, his style may be disarming, but it is a method one easily adapts to. Foreshadowing in the first few pages gives us an inkling of what will follow but what exactly will happen is unfathomable. This is the joy of reading his work – the surprise twist. The author is a master of taking us to a destination other than the place we were prepared to go to. The plot is well developed. The addition of science adds credence to the plot. The characters are well developed. Their back-story is well suited to their role in the novel. Dialogue is consistent with their part in the novel. James Dessen attends a party for an old college friend, Ryan Holder, who has just won the Pavia Prize, a prestigious scientific award. Ryan openly admits that Jason was smarter and that if he had stuck with his research he would have won the award, and changed the world. On his way home after the party, Jason cannot help but think about his life and the road not taken. Jason and his wife Daniella were both up and coming talents in their respective fields. Their lives took a different path when they decided to marry and instead of pouring energy into their careers devoted their time to their relationship and newborn child. While enjoying the night air and solitude of a deserted street, Jason is kidnapped and rendered unconscious. He wakes to a life that is not his. No longer a married professor with a son, he is instead a single, world-renowned physicist with no children. He has cracked the code on the research he had abandoned years earlier when Daniella became pregnant. Now he is in a world where he did develop his creation but never married, never had a child. This novel is about alternative universes and choices. It deals with life. Did you settle? Were there things you wished you had done that you did not do? Where would you be right now if you had taken that job? Not broken up with that person? What would your life be like if you had taken a different path along the way? We make many choices on a daily basis. What if there was a world, a multi-world, where all those choices exist? Each choice we did not make, was made. In this book Crouch investigates the “Many World Theory” of quantum mechanics. At its simplest, anything that can happen will happen, and has happened. Each choice we did not take was taken in a different universe each of which is as real as the one we now exist in. This novel, though a mix of physic theories, is really reader friendly. Both times I read this book I ignored the quantum mechanics it dealt with. I focused on the story for its own merits. After the second reading and while writing this column I did research many of the scientific terms. I had not wanted to do so earlier because I did not want to break the flow of this love-suspense story. Though the science adds a different dimension to the story, the plot stands on its own. I thoroughly enjoyed this book. Wondering “what if” supplied additional depth to the time spent between the pages. An interesting read well worth the time expended. Susan Piazza is the first female commander of the DAV in 75 years, and its current commander. She has been involved with the DAV over twenty five (25) years. She is also Past Commander of the American Legion Post 417, Methuen.